Hans Christian Andersen, from H. P. Paull’s 1872 translation. We could think of Andersen’s moralistic 19th century fable as a thought experiment, an appliance for the cultivation of an abstract imaginary space. It’s only a short step from the classic formulation of the Emperor’s New Clothes to a 21st century game theoretical problem, reminiscent of The Prisoner’s Dilemma, or The Travelling Salesman Problem; an elaborated three person game in which interactions can be modelled algorithmically and generalisations about the world at large generated. Belief is its main theme; the importance of peer group dynamics in establishing belief, the relationship between belief and faith, the need for certainty, the role of power in the creation of certainty. In a sense this recasting is made in the spirit of Edwin Abbott Abbott’s 1884 novella Flatland: A Romance of Many Dimensions. Andersen’s original story builds around a classic vertical hierarchy. It has a singular agent (the emperor) at the top of the pile, a small group of agents (the tailors) below him, and a large undifferentiated mass of agents (the subjects) below the tailors. Although it speaks about blindness rather than clarity of vision, its structure resembles Bentham’s panopticon or the pyramid on the American dollar bill with an all-seeing eye at its apex. This value system determines the dynamics of the space and directs the narrative outcomes, especially the theme of observable, or revealable, truth. With 21st century game theory stylisations, the story unfolds into a narrative space characterised by ambiguity and equivocation. A space where certainty is a question of the dynamic interplay between agents, where agents experience the floor underneath their feet as culturally mediated information, where everything known or intuited is derived from comparisons between the viewpoints of other agents, past and present. Named, re-cognised, by other agents, an agent’s sense of self comes from other agents. Agents are what they are in relation to other agents. An agent’s sense of self is an internalisation of its unique location within a socially mediated informational matrix; a kind of architecture, solid in some parts, vague and malleable in others, which directs thoughts and actions as surely as bricks and concrete and steel direct physical movements. This informational architecture is invisible, untouchable, more evanescent than the air they breathe. It’s like another dimension, impossible for them to objectify because they’re an expression of it. In our game theoretical world the Emperor, the Tailors, and the Subjects become nodes in a trimorphic network, each made up of clusters of agents interacting with one another. The three nodes interpermeate and balance each other in combinations of scale and power. There isn’t any up and down. The network acquires character through its connectivity and degrees of plasticity. Like Andersen’s stripped-down original, there isn’t really any mise en scene against which the characters move. Nothing is solid in any real sense. Energy, materiality and activity are seamlessly folded into one another. All aspects of the network are in motion relative to one another. Density is a matter of the relative changeability of an aspect with regard to an observer. The agents can be thought of as a class of observers. They share parameters which allow them to objectify a particular range of movement within the network and make judgements about the relative speeds of aspects within that range. Those aspects of the range that move the most slowly in relation to the agents are regarded as certainties by them. Similarly, the agents themselves are solidities, or entities, only with regard to the observations they make of each other. By observing the observations of others observing them, the agents internalise a map of their own manner of observing, a kind of self-objectification, or self-definition, which is progressively rehearsed and revised through interaction with groups of neighbouring agents. These groups train and constrain the development of the agent’s self-definition, operating as a control environment which tunes and articulates the agent’s responsiveness, aligning it with the requirements of the neighbour groups. This training gives rise to a kind of spatialisation or narrativisation of an agent’s experience; the Ergo, a transition zone between I describe and I am described. For the agents, to be is to differentiate and be differentiated. Working together over time, the agents have built an intricate framework of agreed upon measurements, descriptions and definitions of the actionable world which they refer to as the Knowledge. The Knowledge has a characteristic topology which is like a distributed map of all the configurations an agent’s body can adopt. Some of this is embodied in the agents through training, some of it exists as structural residues deposited in the environment which modulate the way the agents interact. The Knowledge is a dynamic clustering of fuzzy microworlds crammed with abstractions; interpretive appliances which the agents are constantly rewiring, honing, jury-rigging and stripping for parts. Some of the appliances are in decay, some are humming efficiently and some are smoothly convoluted edifices with arcane surfaces which, whilst arising from the work of the agents, have become highly resistant to modiification. Agents are expressed by their milieu in the same way as crystals are expressed by a saturated solution; an agent is an excess, a calcification which is part of the flow yet distinct from it, subject to agitation by the flow and altering the flow’s dynamics by contributing to its differential viscosity. The agents are structurally coupled to the turbulent flux around them. Within an agent’s body there is continuous movement which reflects the flow outside, but is distinct, speed-regulated, constrained by the agent’s embodiment. An agent’s body could be described as a complex bundle of thresholds under constant agitation, coupled to the granularity and difference in its milieu. These thresholds are zones where differentiation occurs. Wherever movement occurs across a threshold; a change of velocity, a change of state; information arises. For example when an oxygen molecule travels across a semipermeable membrane to adhere to a molecule of iron in haemoglobin the oxygen remains the same but acquires a new informational identity through the transformation of its context. Information is perceivable difference, the establishment of a figure/ground relationship, the expression of this in terms of that. A kind of meta-threshold defines the bodies of the agents; a skin, the transitional zone where the hot outward pulsation of the agent’s becoming meets the cool resistance of its world and settles into a repetitive limit cycle recognisable by other agents. The skin defines the agent in terms of its environment, renders it distinct from its environment, and in the same moment defines the environment as that which is relevant to the agent’s sensitivities and requirements. Across the threshold of the skin the pressures of the turbulent milieu are transformed into sensation. The pressures of the turbulent milieu vibrate the agents’ resistant flesh in complex ways. Articulated by the hypertrophied folds which make up the agents’ sense organs, movement becomes stimulus. There are no stimuli without the apparatus used to differentiate this from that in the flow; stimuli are simply those aspects of the flow that are relevant to the agent. There is a pulsation from the outer to the inner, progressively tuned and refined by the resonant frequencies of the body of the agent, but which exceeds the body of the agent, is amplified through the body of the agent or manifested through it, to become part of the actionable milieu; available for other agents to absorb and reflect and act upon to varying extents. An agent’s connection to the flow is channelled through three search paradigms; sensitive to three kinds of vibration in the milieu; electromagnetic (vision), chemical (taste/smell), mechanical (tactile/auditory). Intermodulation of the three data streams leads to organisational transformation on other levels. This dynamic continues at multiple levels within the actionable world of the agents; network fluctuations are taken into their bodies, sieved and transformed across their bundled thresholds, and recompiled into elaborations of their milieu. 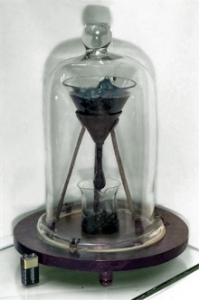 Simplification of the body of an agent, represented by Queensland University’s Pitch Drop Experiment. (1) The velocity of change is modulated by a network of thresholds to bring it into a perceptible range, and categorized within a structure which is an analogue of the body itself. The intermodulation of all the available perspectives the agents have constructed through their interactions generates network’s global identity. Beyond the sampling capabilities of the network is an off-the-dial non-space we’ll call the Absolute. The network is part of the Absolute, it “stands under” the Absolute, and yet the network can never “understand” the Absolute. The Absolute is beyond any apparatus or sensory modality or measurement paradigm the agents have established or can establish through their physicality and interactions. The Absolute is the indescribable, the unobserved, the unthinkable. Colourless, without smell, intangible. The Absolute has no dimensionality. It isn’t outside the agent’s world, or inside it either, but co-extensive with it at every level. It’s the radical void between concepts, and between the elements from which concepts are constructed. The Absolute doesn’t change, because change is a matter of relativities and in the Absolute nothing is relative to anything else; there are no things, no intensifications, no discriminations, since these are all brought into existence through the actions of the agents. The agents establish relationality between themselves, for themselves, in accordance with their resonant physicality. The ratios the agents use to generate knowledge about their world are the ratios of their own bodies; the cubit, the foot, the rule of thumb, the pinch, the hunch, the glimpse. From these “irratios” they have elaborated the arcane prosthetic superstructures [material, informational, energetic] from which constitute their world. It is from the featureless infinity of the Absolute that the turbulent transformative finitude of the agents’ world arises. Like synaptic discharges and lightning bolts, exchange is a product of difference, and paradoxically it leads to local intensifications (channels, conduits, roads, habits) where difference is minimised in order to conserve energy and promote flow. But for the agents every exchange is an exchange of perspectives with unique vectors and tangents which inevitably produces a surplus. For example, while the emperor can bestow his patronage within the tailor node, he’s not an expert. He’s guided by expertise within the tailor node, which may not always align with what he perceives his interest to be. This mismatching arises from the unique imperfections of all exchanges, it generates the surplus which is routinely drawn into other exchanges, producing a kind of cross-talk which has the potential to lead them in unforseen directions. Any stream of data contains infinite possible combinations in a sea of noise, so an interpretive context has developed between the agents to discover patterns solid enough to form a basis for consensual action, that is, to determine meaning. Noise and information are complementary expressions of this interpretive context, but as we have seen, agents can ignore information or act upon noise as if it were information depending on their perspectives. (11) Because the interpretive context is an elaboration of many perspectives, the uncovered patterns are never perfectly resolved; they are subject to hazing, doubling, phase shifts and dropouts. Noise is the lifeblood of the network because it generates diversity and novelty, but it’s also paradoxically the agency of decay, the antagonist of information, and neither of these aspects can be negated. At all scales and levels, in every exchange, the network is continuously striving to maximise both predictability and novelty, to preserve its identity and transcend its limitations; an endless thrashing about on the edges of madness and death. The three nodes of our network are by no means simple and clearly defined identities. Each node is more like a field of energetic influence or atmospheric pressure. As energy moves away from the nodal maximum it encounters resistance and interference from the other nodes which absorb, deflect and refract it, producing irregularities and discontinuities. In these turbulent zones, where the diffusing outward plenitudes of emperor-ness, subject-ness and tailor-ness meet, the energies undergo transformation to produce a foam of meaning, pregnant with noise and chatter. The exhalation of one node becomes the inhalation of the others in a kind of scale-free feedback/feedforward process. The nodes interpermeate one another to such an extent that every point in the system is a confluence of energies, actualised and potential, from all three nodes. For example the emperor is surrounded by an entourage; his advisors, his cabinet, and the bureaucrats through whom imperial activity flows. His closest advisors are those who have staked their lives on fealty to his reign, or let’s say, to the definitions which constitute the imperial reality. We could say that these advisors are built of more or less the same imperial flesh. But there are others in the entourage without such single-minded commitment to the maintenance of those particular definitions, and who might be prepared to disagree, or even oppose, according to the flavour of the circumstances. 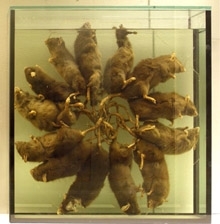 Simplification of the body of the Emperor, represented by the Rat King of Saru, now in the collection of the Natural History Museum of the University of Tartu, Estonia. (12) Photograph by Andrei Miljutin. The emperor can’t be an emperor without subjects, and he can’t signify his difference and position, or maintain control, without his Regalia; a field of signs mediated by the tailors. The tailors and the subjects provide the environment in which the emperor can find expression, and the characteristics of the subjects and the tailors determine the nature of this expression. The three nodes operate together to facilitate and contextualise each other, establishing a matrix of figure/ground relationships which allows each node to distinguish itself. Empire is the vibrational pattern which emerges from their interactions. If any of the nodes is disabled the imperial identity will collapse, and transformation in any of the nodes can lead to transformation of the imperial identity. While the flesh of the emperor’s body might appear to be the purest manifestation of emperor-ness, it can only be distinguished from the flesh of subject bodies through its inhabitation of the imperial Regalia. The Regalia is a field of difference in which the characteristics of the emperor node and subject node can manifest the figure/ground relationships which define them. As the emanation of the emperor resonates through the Regalia it is characteristically modulated by the tailors in accordance with the receptivity of the subject node. It’s within the space of the subject node’s receptivity that the structural principles of the Regalia have arisen. In Andersen’s story the emperor spends nearly all his money with the tailors, they are more important to him than his soldiers and more interesting than the theatre. This isn’t simple vanity; the emperor knows that without his Regalia he is nothing. The signifying field of the Regalia is the space of his actualisation, the transcendental theatre which articulates his power and facilitates his control over hearts and minds of his subjects. He understands that part of his function is to provide a template for the emotional and imaginative actualisation of his subjects, and that if he can do this effectively, questions of defence and cultural development will be more easily managed. Since the Regalia absorbs most of the emperor’s expenditure, a fertile environment is produced for the evolution of an infrastructure of exchange. The more the infrastructure develops and individuates, the greater its energy requirements, and the more the Emperor will spend. The nodes are linked together at all levels in a cycle of mutual self-production. Cause and effect, risk and advantage, are transformed into one another across a multiplicity of scales. In this sense the Regalia produces a dimensionality of its own which leads to the expression of Andersen’s Tailors. Andersen’s Tailors are exponents of the Regalia, elaborated by the Regalia for its own elaboration, products of the Regalia’s own unique becoming. The Regalia’s infrastructure is pattern of intensifications which prefigures the arrival of the Tailors and channels their becoming into the focal points of the story. They arrive following lines of least resistance, conduits in the network created by processes of exchange, the dusty non-linear Route 0.66. Agents try to make their local terrain (material, informational, energetic) as smooth as possible, as certain and predictable as possible, to save energy, to reduce agitation. But threeness makes it is impossible to smooth all aspects of the terrain’s dimensionality. Work which smooths, controls, contains certain material and energetic aspects will reduce smoothness and predictability in the informational. Work which increases smoothness and predictability in the informational leads to unpredictable breakouts in the energetic and material. At this point I want to reconfigure the original story somewhat in order to more closely examine its pivotal theme; the notion of observable truth. Andersen’s narrative shows us unequivocally that the artefacts produced by the tailors are not what they are purported to be; that, in fact, they don’t exist at all. And it establishes a clear intentionality for the tailors, rendering them as duplicitous bad guys, criminal scammers bent on extracting power from the Emperor through their expert manipulation of vanity, pride and ambition. Andersen does this by means of his authorial voice; the master narrator who knows the story and is recounting it to us. We are positioned; outside and above the network with a privileged objective viewpoint, the all-seeing monocular eye of the greenback and the panopticon. The story revolves around the possibility that a transcendent viewpoint can be obtained from within the network’s flux. Because an artefact which produced a transcendent viewpoint would be a useful and powerful tool, and because the tailors have convincing resumes, a critical mass of agents decides to invest in the production of the device, which we’ll call the Sublime Regalia. For Andersen, it’s a neat recursive stratagem which implicates his readers; the Sublime Regalia would grant the Emperor the same power that Andersen grants us; externality from within, a piece of fruit from the Tree of Knowledge. As outside observers to Andersen’s story, we can see the agents acting and reacting with respect to one another within an environment which includes factors which are beyond the experience of the agents. We have a global perspective on the agent’s world, we see them as figures against an environmental ground, but we can only make conjectures about the agents’ experience because we are outside the system. Although we can understand nothing about the complex abstractions which have evolved amongst the agents, we will tend to see patterns, behavioural regularities, cohering around a centralising attractor (a planner, an instigator, a fat controller). However in the culture manifested by the agents there is no central control; at every level of their being the agents are constituted by competing, colluding and co-operating bundles of behaviours. Out of their local trading of perspectives in response to shifting conditions, through their continual movement and on-the-spot approximations, a coherent pattern emerges which is visible to us as an identity, a figure against the ground of our own reference state, but not perceived by the agents who are immersed in its ongoing production. A cat is penned up in a steel chamber, along with the following diabolical device (which must be secured against direct interference by the cat): in a Geiger counter there is a tiny bit of radioactive substance, so small that perhaps in the course of one hour one of the atoms decays, but also, with equal probability, perhaps none; if it happens, the counter tube discharges and through a relay releases a hammer which shatters a small flask of hydrocyanic acid. If one has left this entire system to itself for an hour, one would say that the cat still lives if meanwhile no atom has decayed. The first atomic decay would have poisoned it. The Psi function for the entire system would express this by having in it the living and the dead cat (pardon the expression) mixed or smeared out in equal parts. Paraphrasing Schrödinger we might say that the Sublime Regalia has two possible incommensurable states, smeared out in equal parts across the turbulent nodal system: a; the Regalia exists in the form asserted by the tailors (i.e. : living cat), or b; it’s a figment of someone’s imagination (i.e. : dead cat). The narrator’s observation produces a bifurcation; the network’s psi function folds down on itself and a single state is actualised; all the historical connections along the trajectories which define this state click into place, establishing a frozen crystalline structure with all its pathways, dimensions and angularities determined and immutable. The network is objectified. Schrödinger might say that what we accept to be an objective overview is in fact simply the immobilisation of the incommensurable paradoxical fluctuation of possibles within the situation. If through our act of observation we determine that the cat is indeed dead, everything else tends towards that certainty and action follows accordingly. From whatever observational framework the immobility is induced, belief arises, a decision landscape evolves. Each agent finds itself in an environment conditioned by that observation, one which includes the actions and interactions of other agents, past and present; an environment in which certain modes of being, of acting, of thinking, have a greater probability than others of finding expression. Tendencies and trajectories evolve, and history arises. Within the tailor node’s decision landscape there are three tendencies or trajectories, each with a characteristic evolving pastness arising from communicative exchanges between agents inside and outside of the node. Like the nodes themselves, these tendencies are not distinct or mutually exclusive, they are intricately wound together like fibrous strands with dense entanglements and interpenetrations. Each tendency influences the being, thinking and acting of agents in a subtly different way, like the gravitational pull of orbiting planets. The tendencies soak into the bodies of the agents like red, green and blue inks soak into a bundle of absorbent fibres, combining in various densities according to the resistance of the fibres to produce a dazzling array of colour effects. Every time an agent acts it does so under the influence of the tendencies. And every action actualises a pattern of connections, objectifies a possibility, initiates a folding within the system’s phase space by bringing certain aspects into closer proximity and increasing the separation between others. This folding simultaneously reduces the scope of the possible and establishes lines of least resistance between those aspects which lie in closer proximity as a result of the fold, increasing the probability of further interaction between those aspects. Like rivers or pheromone trails, a kind of systemic phase space memory evolves which provides a template for subsequent action. Each new action along the line of least resistance produces a daughter fold, and the collapse of possibility intensifies as each new fold produces tighter and tighter alignments, like the metallurgy of a Japanese blade. This ongoing process forms a differential granularity, a topology which favours certain kinds of action over others and ultimately leads to the boundary conditions under which trajectories become distinguishable from one another and nodal identity develops. Activity follows the topology, flowing downwards along the paths which conserve the most energy. Agents follow inclinations; intention is simply a bundle of proclivities, an internalisation of the decision landscape’s imperatives. Depending on the agent’s location within the landscape, varying degrees of certainty or vacillation occur as the agent responds to the gradients of the terrain. Areas of high relief produce maximum certainty and commitment. Let’s call the three tendencies which have emerged within the evolving fibrous plenitude of the tailor node the Scammer, the Boffin and the Saint trajectories. A triple helix, each strand of which exemplifies a different relationship to the node’s defining activity, the elaboration of the Regalia. The trajectories complement each other; because of threeness, no opposition exists between them. But oppositions arise within each thread like phase reversals, positive and negative expressions of the tendency. The Scammer trajectory is the familiar one, actualised by Andersen’s narrator into a morality tale of weakness, fear, vanity, corruption and greed. In Andersen’s construction, every single agent within the system, across all three nodes, is to some extent activated by this trajectory. They either believe in the Sublime Regalia or they don’t, but they scam regardless. Nobility does not exist except as a form of innocence, expressed in the child’s naïve, i.e. yet to be instrumentalised, voice. The Boffin trajectory produces agents which labour under a misapprehension. They contend that it is theoretically possible to engineer the Sublime Regalia, but their expertise is narrowly defined, their actions are cautious and incremental and they look for solutions within the tendency rather than beyond it. They are immersed in the continual refinement and elaboration of their own descriptive context and support structures. They regard the Sublime Regalia as an ideal, which should be approached carefully, diligently, one step after the other, without any rocking of the boat. The Saint trajectory induces absolute certainty about the existence of the Sublime Regalia. It makes agents under its influence fearless. They understand that the Sublime Regalia embodies threat, because it has the power and the potential to shatter the framework of the everyday and bring about a fundamental realignment of all the nodes. They regard this as a natural imperative from within the system, a cleansing, affirming, invigorating pulsation that restores the system’s alignment with an unknowable, unperceivable super-systemic absolute resonance. They regard flesh as disposable materiality, a particular narrow frequency band within a complex multidimensional vibration greater than any nodal identity. They understand that the boat has to be rocked, and perhaps even rolled, in order to shake loose the systemic calcification which inevitably leads towards senescence and decay. As the tailor node manifests activity in accordance with all three tendencies, activity in the other nodes resonates in response, providing feedback and developing niches in which the tendencies are reinforced or suffer decline. The problem for the agents is essentially this: there are no reliable perceptions or unquestionable identities. Their world is a world of approximations and descriptions. No thing in their world is available to them unmediated. Every perception is unfolded in a matrix of noise, in fact perception is nothing more than the action of discriminating information from noise amid the data streaming through their three sense channels. Because there is infinitely more noise than information, agents develop mechanisms/strategies to automate the processes of discrimination they require to negotiate their turbulent environment; subroutines which reduce the amount of effort/work required to make a living. These might be specialisations developed by groups of agents, material and informational architectures which store cultural memory and channel activity in recognisably useful ways, clusters of concepts, disciplines, ritual behaviours etc. Since each agent is uniquely located within the field and has a unique perspective, agents continually cross-check with one another in order to build more reliable conjectures. Agents are always attempting to triangulate. Triangulation produces reliable approximate local perspectives whilst simultaneously revealing instabilities, inconsistencies, which require further elaboration and fine tuning. Agents need one another, their abstractions need ongoing corroboration and adjustment to maximise efficient processing of the turbulent local terrain [material, informational, energetic]. As they move through a field of differential intensity, viscosity, flavour and spin, agents work to maintain a consistent pattern of approximations which minimises risk and maximises gain. Because their milieu is in constant flux, the pattern always needs to be patched up or extended in new directions under a jury-rig. Each new intensification causes a new instability with more or less damage to the pattern; think of a spider mending its web after a fly blunders in. The agents trade conjectures, trying to build consensus or detect it. They communicate through symbolic approximations, so each communicative act embodies noise, inaccuracies, like a game of Chinese Whispers. But this very inefficiency ensures the channels stay open and flexible. The closer a cluster of conjectures comes to being agreed upon as a certainty, the more intense and compressed it becomes, the more local influence it exerts, until a point is reached where it becomes objectified; a truth, a given. It casts a shadow. At this point it becomes both a landmark and a danger to navigation, a base and an obstruction. An objectification like this is a storehouse of past interactions; embodied cultural memory, heavy, dense and viscous. A frozen vortex of vested interest. Objectification is the removal of a set of approximations from the temporal flow, the more intense it becomes the slower it moves. Through the process of objectification the agents reduce the rate of change they encounter; objectification occurs when turbulent patterns [material, informational, energetic] are stabilised, immobilised relative to the time scales of the agents. Maximum entropy is maximum uncertainty. Through the objectification of distributed perspectives, the agents increase the predictability of their milieu, reducing systemic entropy and producing an architecture of clusters, filaments, walls(18) which channels their behaviour, directs their interactions, protects them from everyday vicissitudes, and forms their subjectivities as they rub up against it. But the coherence of this architectonic identity, with which the agents so powerfully identify, increases their vulnerability to catastrophic change. This is the darkness embodied in all claims to transcendent truth. The agents occupy a densely folded space of abstractions and recursive descriptions, a multitude of layers kneaded and interleaved and intermodulated, each bubble and niche producing a characteristic resonance. It’s a space of “many worlds”(19) since each unique local perspective produces idiosyncratic alignments. Each unique point of view shares points of correspondence with other points of view, but is also fundamentally divergent. This is what provides the flexibility of the system. The fact that there isn’t any total perspective, and that there are only ever approximations, is what allows the system to remain open to changing circumstances. Agents are always in the process of refining and redefining the abstractions with which they apprehend their changing world. They work hard to increase the reach and scope and explanatory power of their descriptions. But the need for constant ongoing redefinition requires energy, which they must work to generate. They try to minimise energy expenditure because everything they do to generate energy also produces a change in perspective, deforms their descriptions, which then require redefinition, which requires more energy. Agents prefer to have a stable set of global abstractions which operate predictably and reliably under most conditions. But since all abstractions are built on webs of approximations and subroutines related to local tasks with varying degrees of coherence, at the edges where the abstractions bleed into one another uncertainty arises, which needs to be patched, attended to, worked upon. This cognitive circularity is an inevitable consequence of multiplicity, of inexactitude. The agents can only ever engage in the ongoing development of workable solutions to a shifting pattern of consistencies and inconsistencies. Truth in their world is reached through a random accumulation of errors. The totalising view of Andersen’s monocular observer would be great but it’s impossible to achieve because of the nature of threeness; because of the agents’ radical incompleteness, their simplicity, computational inefficiency and constitutional agitation. In fact totalisation could only mean the end of movement, the end of becoming, the end of awareness for the agents. So it’s a kind of death that they unknowingly seek. For some of the agents, the sense of themselves as radically incomplete is a cause of great distress, which they seek to ameliorate by gaining greater control over one or another aspect of threeness. For others, the acceptance of radical incompleteness is the generator of great joy, because at some level they recognise that as information and materiality are reduced in a given space, the energetic potential of the space increases towards infinity. 1. Recognized by the Guinness Book of World Records as the longest-running laboratory experiment. Set up by the first Professor of Physics at the University of Queensland, Professor Thomas Parnell, in 1927. The experiment demonstrates the fluidity and high viscosity of pitch, a derivative of tar once used for waterproofing boats. A sample of pitch was heated and poured it into a glass funnel with a sealed stem. The stem was cut in 1930 after the pitch had settled. Since then the pitch has slowly dripped from the funnel; 79 years later, the ninth drop is only just forming. A falling drop has never been witnessed or recorded. http://www.physics.uq.edu.au/pitchdrop/pitchdrop.shtml. Hayes, Brian. Third base. American Scientist. Vol 89 No 6. Nov/Dec 2001. p.490. 3. Barrow-Green, June. Poincaré and the three body problem. Providence, RI: American Mathematical Society; London: London Mathematical Society. 1997. 4. Dauben, Joseph W. Georg Cantor: his mathematics and philosophy of the infinite. Cambridge, Mass: Harvard University Press. 1979. 5. Gleick, J. Chaos: making a new science. New York, N.Y.: Viking. 1987. p.91-92. 8. Hetherington, K.; Lee, N. Social order and the blank figure. Society and Space Vol 18 No 2, 2000. p.169-184. 9. Black, Fischer. Noise. The Journal of Finance, Vol 41 No 3, July 1986. p.529-543. 10. Berns, G.S., Chappelow, J., Zink, C.F., Pagnoni, G., Martin-Skurski, M.E., Richards, J. Neurobiological Correlates of Social Conformity and Independence During Mental Rotation. Biological Psychiatry. Vol 58 No 3, August 2005. p.245-253. 13. Bonabeau, Eric; Dorigo, Marco; Theraulaz, Guy. Swarm Intelligence: From Natural to Artificial Systems. New York : Oxford University Press, 1999. p.207. 14. Schrodinger, Erwin. The Present Situation in Quantum Mechanics: A Translation of Schrödinger’s “Cat Paradox Paper”. Translator: John D. Trimmer. Proceedings of the American Philosophical Society. Vol 124. p.323-38. 15. Zipf, George K. Human behavior and the principle of least effort: an introduction to human ecology. New York, Hafner, 1965. 16. Asch, Solomon. Opinions and Social Pressure. Scientific American. Vol 193 No 5, November 1955. p.31-35. 18. Mandelbrot, B. and Novak, M.M. Thinking in Patterns: Fractals and Related Phenomena in Nature. World Scientific, 2004. p.22. 19. DeWitt, B.S., and Graham, N (eds). The Many-Worlds Interpretation of Quantum Mechanics. Princeton, NJ. Princeton University Press, 1973. 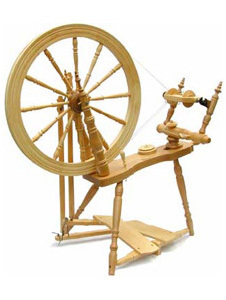 Image: Spinning wheel, internet source, photographer unknown.